For event photography, having the ability to create backups of your image is essential in case the memory card is corrupted, theft, or stupidity. (Something stupid would be reformatting a card and overwriting pictures.) I do have an Epson P-7000 which allows me to backup memory cards immediately after they are full. The P-7000 even has the ability to act as a tethering device to write copies of the images to the external hard drive immediately. The only problem is that you need to be physically tethered to the device with a USB cable. Not very convenient. Along comes wireless hard drives like the Seagate Wireless Plus. I ordered one of these 1TB hard drives with the sole purpose of using it as a wireless tethering device. The only problem is that out of the box, this is a streaming device, and doesn't work the way I want it to. Solution? The friendly folks at www.hackseagatesatellite.com have released an alternative firmware for the Seagate Wireless Plus. For just $35, the firmware allows you to run the wireless unit as an Eye-Fi server. 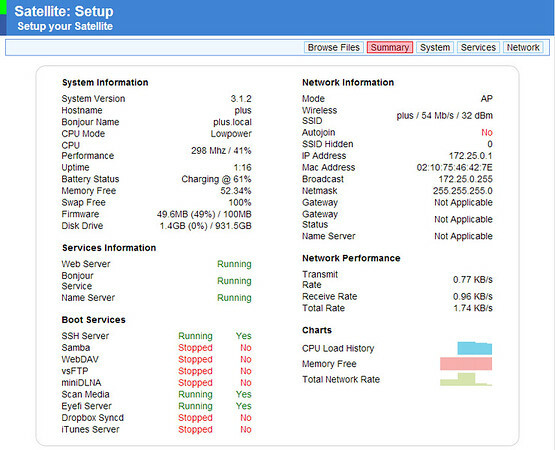 It's got other features too like FTP, Samba, iTunes server, and dropbox synchronization. However, I plan on using almost exclusively for wireless tethering at events. I recently upgraded one of my dSLR cameras from a Canon 5D Mark II to the 5D Mark III, which coincidentally has a secondary memory slot. This memory slot can house SD cards, which make using an Eye-Fi card possible. This means that as you take pictures, the images are wirelessly transmitted to the Seagate hard drive within seconds.The drive comes with a USB dongle which allows you to use the drive as an external USB hard drive, so it has other purposes. I have an event this weekend, and plan on testing the range on the hard drive, and if all my images show up automagically. Please note, that once you load this alternative firmware, the Seagate ipad/android apps no longer work. It's a trade off for going from a streaming device to a wireless server. I am quite interested in buying all 3 of these products (Eye-Fi, Wireless Plus & the firmware). You've written: "This means that as you take pictures, the images are wirelessly transmitted to the Seagate hard drive within seconds"
Does the Wireless Plus have to be turned on and sitting somewhere for all the photos to transmit? If I use it for travelling and the Seagate is sitting in the hotel room, will the photos taken on the Eye-Fi just send through space? If the distance is too far, would it automatically send once I get back into my hotel room? Would appreciate your experience on this matter!